The word “binge” according to the dictionary means, “An act of excessive or compulsive consumption.” This means it is not something you should be doing. In simple words, “binge-watching” or “marathon-viewing” indicates an act of watching multiple episodes of a TV show or movies in one sitting. For instance, it’s a Saturday night, and you are snuggled up in your warm bed watching Stranger Things. Before you realize it, you spend hours watching the whole season all at once. This is known as binge-watching. Research shows that people who love to binge-watch TV shows can suffer from anxiety and/or depression in the long run. So here are four reasons why you should stop binge-watching your favorite TV shows. Which is why if you think you are a binge-watcher, you need to get moving and start some physical activity to get that blood circulating in your body. When you watch too many TV shows, you start to imagine yourself like the characters in the TV shows you watch. This creates an ecstatic feeling of temporary escape from the real world, as you tend to live in a fictional world. People who go through a break-up, or who are not happy with their lives in general, find relief in binge-watching TV shows, which creates a sense of satisfaction in their mind. Continuing this, in the long run, could lead to lower self-esteem. It is very easy to stay home on a Saturday night and binge-watch Game of Thrones, and not care about anyone else. But if you continue this habit for long, you eventually end up with fewer friends and no one to hang out with. 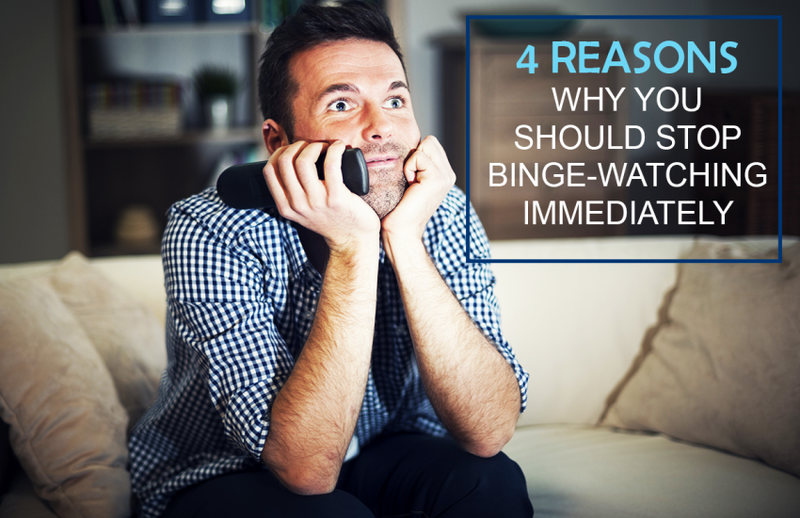 Your binge-watching habits can affect your communication and socializing skills in a negative manner. This is why it is always better to hang out with your friends and colleagues every now and then to keep yourself socially active. People who stay up all night to binge-watch TV shows usually don’t get enough sleep. In another instance, marathon viewers tend to oversleep. In both cases, your body can not keep up with your dysfunctional sleep cycle, and you feel tired and sleepy the next day. This can cause the person to feel irritated and angry. Since your sleep pattern is disrupted, staying up late at night also messes up your eating habits, thus causing you to slack on your daily diet. Like every other thing in life, binge-watching can be a fun activity if done occasionally. Researchers suggest two to three episodes a day is ideal for TV lovers to enjoy their favorite shows. On top of that, watching fewer episodes each day would make your favorite TV shows last longer. Previous Post:Will Artificial Intelligence Unlock the Future? Next Post:Frozen – A Walk Through Human Psychology!